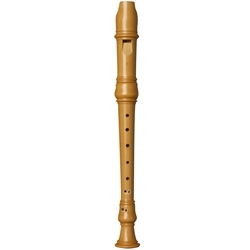 A sopranino in ivory by Johann Christoph Denner is preserved in an instrument museum in Basel, Switzerland. It is marvelously suited for playing Vivaldi concertos for flautino, and arias with recorder obbligato imitating birds. Our copy is made of European boxwood, in two pieces with double holes, pitched at a=415. Several fine recordings using our Denner sopraninos have been very successful.